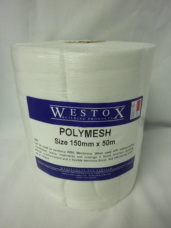 A 100% polyester spun laced material composed of staple fibres forming a strong unbounded structure. Forms an excellent bonding, barrier when used with waterproofing membranes. 50mm, 70m, 100mm, 150mm, 200mm, 300mm, 500mm all x 50mm wide. 1220mm x 50m wide & 1220mm x 100m wide.